First Ski Vacation? Here are 5 Things You Need to Know Before You Leave! You don’t need as much gear as you think. Most people erroneously believe they need to rush and buy every recommended snow item available. As a result, they load themselves down with expensive gear, like skis and snow suits and goggles. While these are necessary items for the trip, you don’t need to pack five suitcases worth of stuff. Not only is it cumbersome to keep track of so much stuff, it is quite expensive. If you are a first-time skier, then consider rentals for the larger, more expensive items. Most ski resorts carry skis, snow suits, snowboards, and any other gear you may need. Renting is not always the best decision, but for a first-timer, it can be the smartest. Not only does it relieve you of the extra expense of ownership, but it allows you to get a feel for some brands in the event you find yourself choosing to continue in your pursuit. You won’t want to ski the entire time. Yes, it is true you are headed to a ski vacation and you will want to ski. But snow sports expend a significant amount of energy, and every muscle group in your body will be engaged. Definitely plan for a day of relaxation while on your trip. 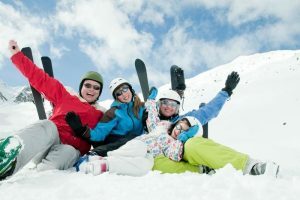 This does not necessarily require a visit to the spa, although if that sounds appealing, then rest assured that most ski destinations offer such spots. Hiking, historical towns, local festivals and wineries are also great things to keep in mind when you are choosing a location. Extra diversions won’t take away from your ski trip – they will only enhance your visit. There are always online deals to be had. Snow sports can be expensive endeavors. Fortunately, many ski resorts offer discounts throughout the year. One great tip is to find a ski lodge that includes a combination of rentals. In other words, some hotels offer standard hotel rooms, along with suites, cabins and condominium-type rentals. With a condominium-style hotel, you should be able to choose a privately owned room. This allows for a variation in the prices. Just remember to always do your online searches before you make any bookings. Lessons are a worthy investment. If it is your first time on skis, then be sure and invest in ski lessons. While they may be expensive on the front-end, they can save you a lot of time, trouble and heartache in the long run. Plus, ski vacations are always more enjoyable if you know how to actually ski. Brief yourself on ski safety. Partaking in cold-weather activities can be such an exciting adventure, but there are some common-sense tips you should be aware of. Make sure you do your research ahead of time to brief yourself on ski safety in the mountains. Purchasing ski lessons, as suggested above, can also be a great avenue to pick up some safety advice. Planning your first ski vacation? Check out LiftsWest.com for more information today!